Udaipur is amongst the best honeymoon and historic destinations in India. Nestled in the state of Rajasthan, this city is called the ‘City of Lakes and Palaces’. The combination of natural lakes and manmade palaces make this destination a one-of-a-kind one. City Palace is easily amongst the finest places to visit Udaipur and its ‘Light and Sound Show’ is one of its major highlights. For exploring the palace, you need to visit the tourist attraction during the daytime. But you have got to come back later in the evening for getting forlorn in the history of this place through the words of Pandit Narendra Mishra, the official poet who has penned the script of ‘Yash Ki Dharohar’ which is narrated during this show. The one-hour episode is a rundown on the Mewar dynasty and paints a vivid imagery of the rise of Udaipur. The story travels back in time and takes the viewers onto a poignant journey spanning over a period of 1500 years. Expect to get smitten by the wealth of historic information, also expect a lump or two in the throat! The rendition is beautiful and the words are powerful. Timings: The Hindi shows are held between 8-9 pm (May to August). The English narrations are beamed from 7-8 pm (September-March) and from 7:30-8:30 pm (April). Ticket price: The tickets are priced between Rs 100-200, depending on the location of the seat. The ground seats are cheaper while those on elevated platforms are pricier. Children can get away with tickets costing Rs 50-75. The tickets are available at the ticket counter at City Palace. 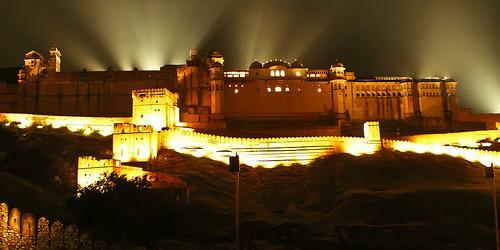 During your Rajasthan tour, in case you happen to drop by Jaipur, you can also catch up with the ‘Light and Sound’ show held every evening at Amber Fort. This is one of those shows which will make you fall in love with history, even if you have loathed it all your life. The baritone voice of Amitabh Bachchan is spellbinding and the script is full of such impactful words and lucidity that you will be in a daze by the time the show ends. The ticket price is Rs 100 for the Hindi show and Rs 200 for the English one. We would suggest that you watch the Hindi show if you understand the language. Under the best Jaipur packages, you can also do plenty of sightseeing and check out spots like Chowki Dhani, Jal Mahal, Jaigarh Fort and Hawa Mahal. This entry was posted in Holidays, Jaipur and tagged City Palace Jaipur, Hawa Mahal, Jaigarh Fort. Bookmark the permalink.